AuttyW: The Makeup Show Orlando LIVE Competition! 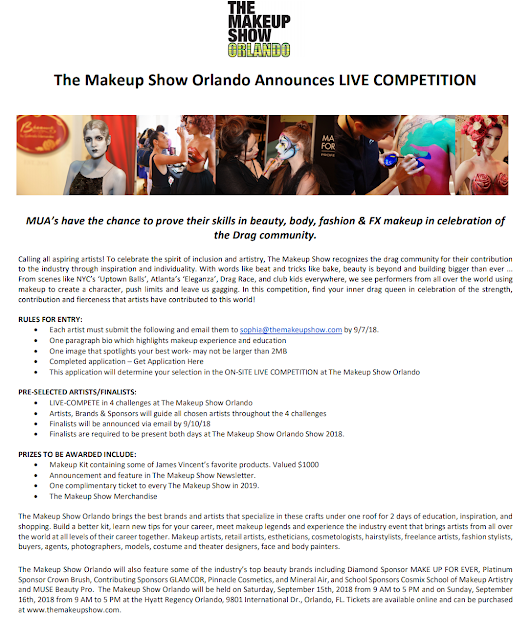 The Makeup Show Orlando LIVE Competition! It's that time of year again! It is time to get insanely hyped up for The Makeup Show in Orlando! This year they are doing a LIVE competition in celebration of the Drag Community! I think that it is the coolest thing, and I can't wait to see or hear more about it! I think that it is really neat that it is going to be a live competition as well! I love watching artists create their work, so this would definitely be something to make sure you see! If you are wanting to enter the contest, definitely check out the Press Release and all of the rules! (I don't have the actual link to the application, so I would suggest emailing Sophia for it!Her email is in the information above! If you do enter! Good luck! I hope you make it in and win! I can't wait to see all of the talent that will come out for this!